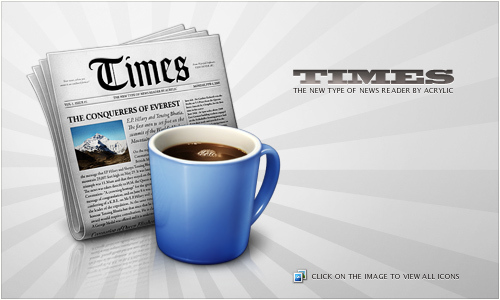 Times is Acrylic Software's new type of newsreader for Mac OS X Leopard. With the user interface through Core Animation user-provided RSS sources function like a virtual interactive newspaper, offering the user a natural experience as a newsreader. The icon for Times is a semi-realistic 3D illustration designed to well match other Apple application icons. As well as the 512x512 pixel large icon, fine-tuned graphics were pursued in all sizes. Manual editing of pixels and enormous retouching were performed in diverse areas, including the news texts on the icon and the mask processing for smooth borders. A website design for a middleware company.